“It was absolutely marvellous, such wonderful singing!” was the oft heard comment when the choristers of St Matthew’s Church, Albury sang Choral Evensong at St George’s Church, Numurkah, 5pm Sunday 16th October, 2011. Ten choristers led by Music Director John Ross, with organist David Luxon joined with Archdeacon Peter McLeod-Miller and Fr Kim Benton, Rector of Parish of Numurkah-Nathalia in offering this ancient and very beautiful evening worship from the Book of Common Prayer. In his homily Fr Peter McLeod-Miller spoke of the importance of hospitality and the pleasure of sharing with other parishes in the Diocese. 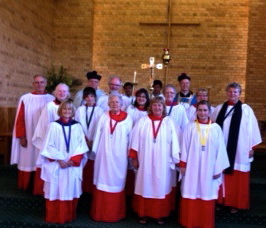 The service of Choral Evensong was offered as part of the Numurkah Foodbowl Festival held over the weekend. Fifty parishioners joined with visitors to share in a soup supper after the service. “It gave us great delight to participate in such meaningful worship and the opportunity to share hospitality with our friends from Albury,” said one parishioner from St George’s.